I wanted to try this dates balls after seeing Priya's Dates Peda. I wanted to try this sometime this week. Yesterday my kids wanted to eat laddoo all of a sudden. 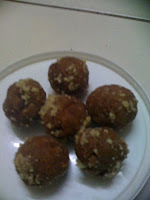 I am not good in making laddoo so I tried convincing them that I will make something else. So started making this peda and instead of making it as peda I just rolled it and made it laddoo. They were not happy to see brown color laddoo (thats what they said), but they liked the taste. I added couple of more ingredients to her recipe and made it choco balls. Soak dates in milk for an hour. Then grind the milk-dates mix along with paneer and make it a paste. I also followed Priya's method. Just microwaved it for 6 mts. Stir it in between. Add cinnamon and chocolate syrup in between while stirring. When the paste comes like a ball, add melted ghee and make it small balls. In the mean time, grind the nuts into fine powder and roll the choco balls in it and serve it hot. It tastes really good. I just made 6 balls cos I was not sure whether my girls will like it or not. After finishing them, they quietly told me that it tasted like dates and not like chocolate balls :). I am sending this to Srivalli's kid's delight - Finger Food. 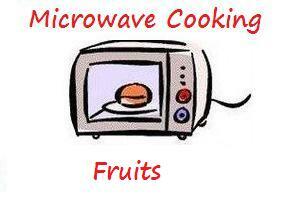 Also this goes to Nivedita's MEC- Fruits event, started by Srivalli. Wowwwwwwwwwwww.. looks so cute and delicious.. yummy !!! Such a simple but perfect recipe. Cute looking balls, very tempting.. Delicious and cute chocolate dessert. Thank you for stopping by my blog and leaving your comments. This recipe sounds quite easy to do and I am sure it will be a smash hit with kids. Thanks for the quick dish Vidhya, I am sure kids will love these..:)..